I have eaten at Akasha in Culver City several times and always loved their food. 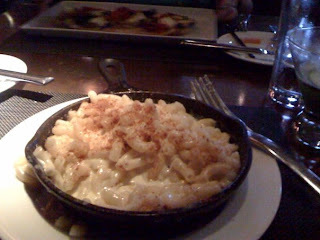 For dinner this past week, I had to try their Organic Macaroni & Cheese. It is listed as a Side Dish and only costs $8.00. They serve it in a small cast iron skillet. It is a fairly generous portion for a side dish, and I thought it was enough for an entree. The cheese was a mix of cheddar and Swiss. The Swiss cheese definitely made the pasta very gooey, and it would streeeeeeetch from the pan to your fork in these long, delicate cheesy strands. The Swiss added a nutty flavor to the creamy cheddar. There was also a hint of sweetness, which made me wonder if they used either nutmeg or perhaps even a dollop of heavy cream in the mixture? The sauce itself was on the milky side, but not too soupy. (I prefer my mac and cheese sauce to be thicker, but this thinner sauce was fine.) The macaroni was cooked to the right consistency - not too mushy, not too tough. It was a very simple presentation, just a black cast iron skillet set against a plain white dish. The only garnish were some toasted, very buttery and spiced bread crumbs on top. It was a very tasty mac & cheese, rich but not too rich, with a silky texture. However, if they serve a larger portion or turn this into an entree, I think this dish might be too "bland" because it's a pretty straightforward mac & cheese dish. I would recommend some pancetta and fresh herbs to liven it up if they serve a larger portion. But for the side dish, it's a nice complement to your main entree and can be shared with another person. I love the nuttiness of Swiss in mac! I found out nutmeg is often used in making mac & cheese, so the sweetness had to be from that! At least I'm speculating!